Jamie Lin is well-known in Taiwan for being a founding partner of AppWorks,an accelerator based in Taipei that was created in 2010. The slogan of AppWorks is: “By Founders, For Founders." This means it helps entrepreneurs grow their businesses rapidly, Lin says. “Founders are the ones who are brave enough to get out of their comfort zones and create different paths,” Lin says. Lin says bravery is one of the key personality traits a founder needs to possess since courage is required to push for changes with the use of innovative ideas to improve the environment. AppWorks has helped at least 860 founders, its website says. The accelerator’s’ alumni, nicknamed the “ AppWorks Mafia” in Taiwan,, include EZtable, and Shopback. 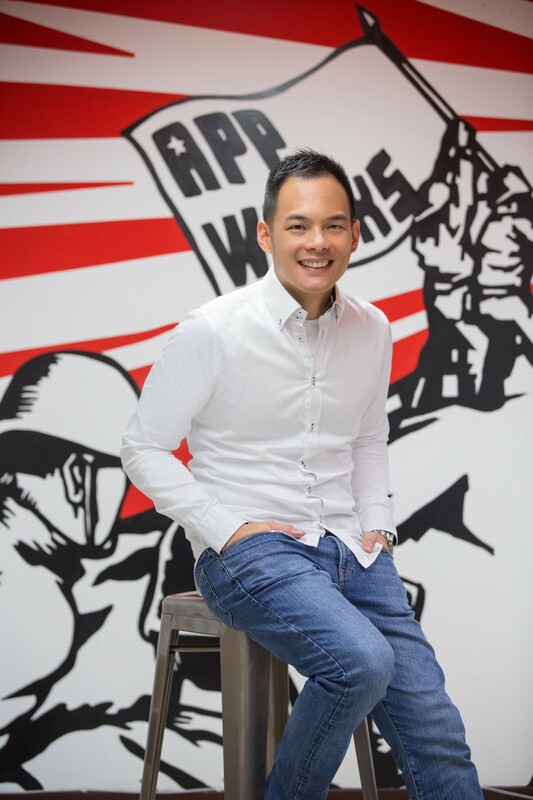 Caption:Jamie Lin, Founding Partner of AppWorks. Lin, who received a bachelor of science in engineering from National Taiwan University, and a master’s degree in business administration from New York University’s Stern School of Business, was not only a successful student. During this period at the young age of 21 he was an entrepreneur who co-founded his first business, an e-commerce startup called Hotcool, in 1999. Later on he co-created Intumit, Sosauce.com, and Muse Games. Lin's experience of being a founder led him back to Taiwan with an ideal of making more contributions to Taiwan’s startup ecosystem. He created AppWorks with an aim of helping the younger generation also become founders. “I love to be different and unique. Everyone is different, and I love to do things that can foster an impact,” Lin says. “Even if I can help just one founder find his or her own business route, it’s not just a change for this person, but also for the company’s growth and the whole environment. “Bringing more changes is a positive thing I’d love to see.” says Lin. “Mr.Jamie” has been Lin’s blog since 2009. It keeps track of Taiwan’s startup ecosystem. Since then he has stayed engaged with this community. The purpose of establishing AppWorks since its inception has been to “help solve problems, cross-promote and connect with investors and business mentors, Lin says. AppWorks focuses on technologies such as AI and Blockchain. The accelerator also organizes “Demo Day,” which is a chance for founders to present pitches in front of more than 1200 investors. There’s also “Mentor Day,” an event for helping startup founders connect and meet with successful entrepreneurs and exchange experiences and support one another. And there's “Partner Workshop,” which is hosted by the accelerator’s’ backers, such as Nvidia, Microsoft and others. Raising funds is one of the huge headaches experienced by startup founders. Therefore, AppWorks is also a source of venture capital. Whether it’s putting together a startup’s first round of institutional financing or launching an Initial Coin Offering, AppWorks is ready to help out Taiwanese startups, with two funds of altogether US$61 million. It hopes to raise a third fund of US$ 100 million by the end of 2018. Lin thinks Taiwan’s startup ecosystem should be connected to Southeast Asia, the world’s emerging and fastest-growing market. First of all, Lin says, the geographic location of Taiwan can make it a hub for accessing neighboring countries' markets. Second, Lin says, Taiwan can be a model for other developing Southeast Asian nations. For example, he says, the size of Taiwan’s GDP is close to that of Indonesia but its e-commerce market size is greater. “That’s why some e-commerce platforms from that region come to Taiwan to mirror (its experiences) and try to learn Taiwan’s ways of doing things,” Lin says. Third, research and development talents are assets that Taiwan possesses. IBM, Google and Oath came to Taiwan to open research and development centers. Importantly, Taiwan’s Google research and development center is the biggest one outside the U.S., Lin says. “We can see that these tech giants have already sensed the talent we have, so they set up research and development centers here to cultivate more talent,” Lin concludes.